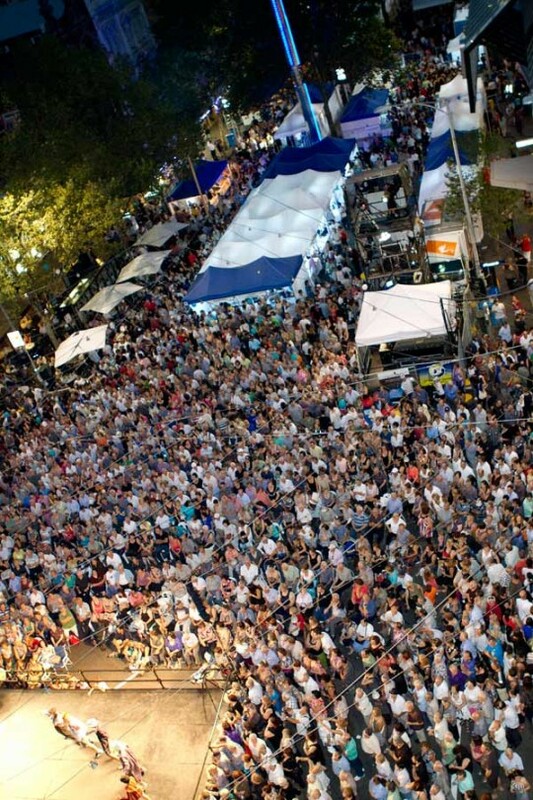 More than 90,000 people endured the heat to enjoy all that the Lonsdale Street Glendi had to offer on the weekend. During the official opening of the 2012 Antipodes Festival on Saturday evening, launched by Acting Premier Peter Ryan, Prime Minister Julia Gillard announced that the Federal Government will contribute $2million to the Greek Cultural Centre to be built by the Greek Orthodox Community of Melbourne & Victoria. “We are thrilled that Prime Minister Julia Gillard is supporting our exciting new project, and her announcement is testament to the vitally and strength of Melbourne’s Greek Community,” said Bill Papastergiadis, President of the Greek Community of Melbourne & Victoria shortly after. “The Antipodes Festival has had ongoing supporting from the State Government of Victoria, and in 2011 further financial support was pledged to include the Greek Cultural Centre, which will commence development later this year. We are overjoyed that our efforts have been recognised at a Federal level, and we look forward to sharing our projects with the whole of Australia.” Leonidas Vlahakis & Tammy Iliou, Co-chairs Antipodes Festival. Other speakers during the opening included Leader of the Victoria Opposition Daniel Andrews, Lord Mayor of Melbourne Robert Doyle, Bishop Ezekiel of Dervis, Leader of the Opposition Tony Abbott and General Consul of Greece to Melbourne Eleni Lianidou. Thousands crowded around the main stage to see Pantelis Thalassinos and his band perform two hours of old favourites including Ta Smirneika Tragoudia and Karavia Chiotika, and other songs from his new upcoming album. In addition to the 57 stalls that lined Lonsdale Street, the Chobani Greek Kitchen, Neos Kosmos Cultural Plateia and Della Rosa Kids Space offered plenty of entertainment for Glendi goers. The Chobani Greek Kitchen hosted cooking demonstrations by several much-loved local chefs and cooks including Vicki Peppos and Mary Valle from the Sweet Greek Cooking School and Susie Rerakis, Katina Rerakis and Eleni Gerasimou from Philhellene Provincial Cuisine. The Della Rosa Kids space provided many proud moments for parents, who could see their children perform in traditional Greek costumes. Many learned how to Greek dance or relaxed with some Greek storytelling. Half way down the street in the Neos Kosmos Cultural Plateia, a number of cultural organisations demonstrated traditions from various regions, through dancing, music and exhibitions. Withstanding 36 degrees on Sunday to dance the Zorba for over an hour, was Harry Pantelios. His efforts were rewarded with a trip to Greece courtesy of Touchdown Tours. Winner of the 2012 Best Greek Coffee competition was Yiannoula Capones from Ararat. Thank you to Oasis Coffee for their prizes and involvement in this fun event.